Melania Trump, the first lady, distanced herself once again from her husband on Saturday, praising the basketball player LeBron James for his work with disadvantaged children hours after President Donald Trump directed a Twitter broadside at the star. In June, Mrs Trump said she hated seeing children separated from their families at the border – a consequence of a White House crackdown – and she has cut an increasingly independent figure. The latest incident began on Friday night when James said on CNN that “he would never sit across” from Mr Trump. His words provoked a late-night riposte from a president, who is known to monitor TV news channel as he fires off tweets. Critics pointed out that Mr Trump had completely ignored the fact the interview – conducted at James’ “I Promise” school in his hometown of Akron, Ohio – was to showcase the basketball star’s efforts to help at-risk children. Mrs Trump, however, highlighted the work with a statement released through her spokeswoman. 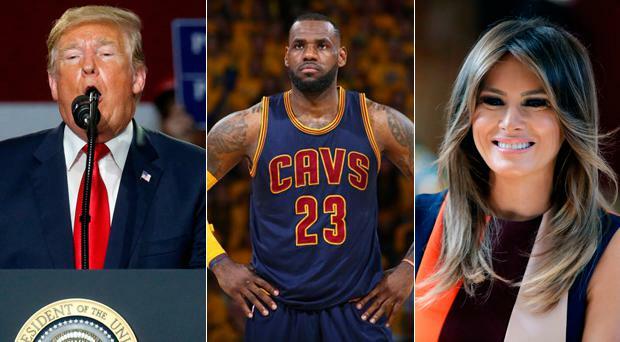 “It looks like LeBron James is working to do good things on behalf of our next generation and just as she always has, the First Lady encourages everyone to have an open dialogue about issues facing children today,” said Stephanie Grisham. She also noted that Mrs Trump’s Be Best initiative promoted responsible online behaviour, in perhaps another not so subtle dig at her husband. “Her platform centres around visiting organisations, hospitals and schools, and she would be open to visiting the I Promise School in Akron,” she said. She is not the only family member to push back against Mr Trump. On Thursday his daughter Ivanka said the family separations marked a low point of her time at the White House and also said she did not view the news media as “the enemy of the people”, despite her father’s stance.